Last time not worn: Technically 1999, though only because Morris was out all year with Tommy John surgery. So actually 1985. Happy March from a snow-packed part of Cardinal country and for the first time in this countdown, picking a non-Hall of Fame pitcher was essentially a done deal as soon as this number entered the discussion. That’s to take nothing away from Westbrook, Pineiro, or even Martinez who was dealt by Whitey for one of the stars of 1982, Lonnie Smith. But as far as I’m concerned, #35 will always belong to Matty Mo. Morris was the homegrown star who epitomized the term fast-riser by spending just over a full season in the minors and had exactly one appearance at AAA. He finished second in the 1997 Rookie of the Year voting and took over the ace role even on one of the few sub-par TLR clubs. Most St. Louis fans remember 1998 as the year of the long ball for good reason but not this particular Birds on the Bat lifer. Morris struggled with injuries and wouldn’t contribute as a full-time starter again until the 2001 campaign, and that still breaks my heart. He was the perfect blend of big-game pitcher with as much bad luck as possible to boot. When healthy as he was that memorable ’01 campaign, Morris anchored the second best rotation in the game and had the Cardinals contending for a title. Of course as fate would have it, he finished third in the Cy Young voting to both of the stars of possibly the strongest 1-2 punch in history. Arizona would win the World Series behind their aces, and that was truly the best opportunity for Morris to leave his mark. He helped beat the Diamondbacks the following October but would only win one more postseason start the rest of his career. But make no mistake about it, I will always remember Morris for what he did against the rivals the last time they were truly competitive. 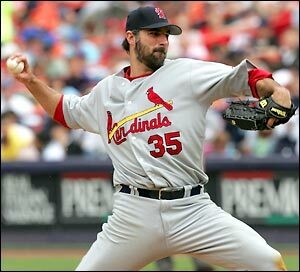 Many of my favorite games were when Matty Mo was carving up the Cubs, and that still brings a smile to my face. It won’t be long until Morris takes his rightful place with the rest of the Cardinal greats, and his legacy in St. Louis goes well beyond any stat. He was the glue that combined many of the pieces that won titles, and I hope he someday chooses to join his good friend back in the game. Just think what young hurlers Rob Kaminsky and Alex Reyes could learn from the battery of Morris and Mike Matheny.